Collaborating with technology is easy. From time to time, however, the real connections happen with face-to-face interactions. At #MOREnet2019 we want to help you be better connected. 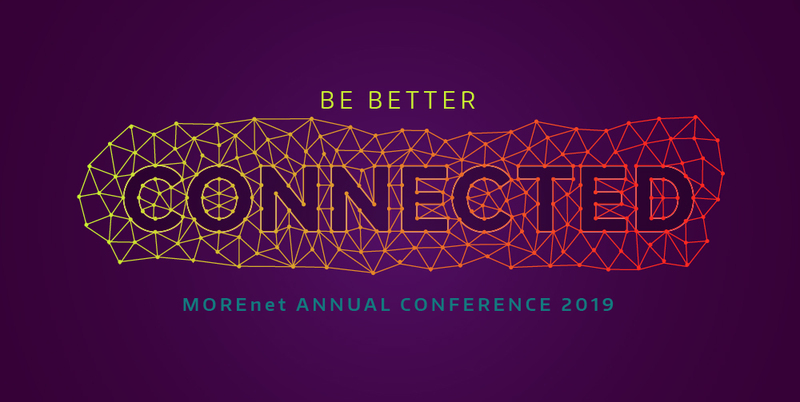 MOREnet Annual Conference is an amazing opportunity to be present to connect in a hands-on learning environment without all the daily distractions. You will leave with turn-key solutions and best practices to immediately take back and implement as well as big ideas that are new and innovative. In addition to high-quality educational sessions, there is also ample networking to strengthen human connections. Come ready to connect and be ready for an in-depth alliance of tools and an expanded network. Plus connecting with a peer group is not only rewarding but can be fun! Don’t miss these opportunities. Connect with new technologies, connect with your peers, connect with us! Come to #MOREnet2019 and be better connected! Join us this October 7-10 at Tan-Tar-A Resort in Osage Beach. You can register for either 2-days or the entire 4-day conference. The MOREnet consortium advocates for academia and public sector as their trusted technology partner. Our annual conference is the place they come to see sophisticated technology and an overview of how to use it. Our commitment is to provide the best services and the greatest visibility for our vendors at conference. We strive to find new ways to improve the services we provide so that you can successfully promote your products and services.